Important policy updates from 1st December, 2017 – 7th December, 2017. The Cabinet has approved Rs. 9046 crore for the purpose of National Nutrition Mission. This body will aid in monitoring and supervising the initiatives taken by ministries to eradicate malnutrition. The targets set by the Government include a reduction in stunting, anaemia among women and children by 2% and 3% respectively. The programme will cover districts in a phased manner. The Minister for Commerce and Industry inaugurated the first ever International Conference and Exhibition on AYUSH and Wellness, ‘Arogya 2017’. In partnership with FICCI, the Government has organised the event to showcase the significance of traditional systems of medicine. Delegates from India and about 60 countries are taking part in the event. The government has announced that it will be collaborating with other countries in this field. Business and trade leaders from India have pledged to support the Mission with nearly Rs 500 crores. This will be used for developing amenities and required infrastructure in and around the river. The Government is inviting financial support from the private sector, in a way that the industries can support a project of their choice, to clean the river. In the first phase (2015-17), 100 million Soil Health Cards have been distributed, and the Ministry of Agriculture aims to provide them to all 120 million farm holdings by December, 2017. The National Portal of the Soil Health Card contains information regarding the online registration of soil samples and the test results, based on which, the recommendations are processed. Maharashtra has become the first state to frame a specific industrial policy for women. The policy provides for a capital subsidy of up to Rs 1 crore, based on where the unit is located, to first generation women entrepreneurs investing in Micro, Small or Medium Enterprises (MSMEs). Incentives such as lower power tariffs and higher interest subsidies will also be provided. The policy also seeks to incentivise women entrepreneurs in industrially backward regions, along with some benefits extended to existing women entrepreneurs as well. International Solar Alliance has become the first treaty-based international government organization, ratified by 19 countries, that will be based in India. 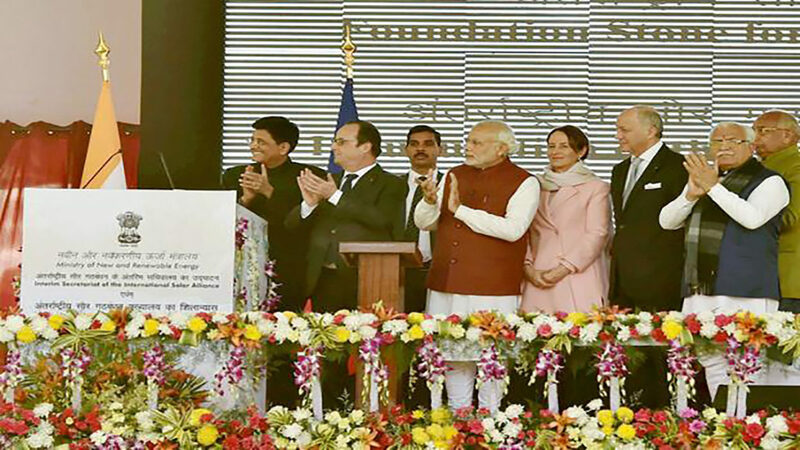 The initiative, jointly launched by India and France, attempts to reduce obstacles for deploying solar projects on a large scale, by increasing cooperation and coordination between solar-rich countries lying between the Tropics of Cancer and Capricorn. It also aims to reduce costs incurred, by aggregating demand from member nations and accordingly invite tenders. The Prime Minister inaugurated the B R Ambedkar International Centre in New Delhi. It established with the intent to develop it as an important centre to conduct research on socio-economic issues. It will also seek to promote the teachings of Dr. B R. Ambedkar. With an aim to introduce reforms in the existing Public Distribution System (PDS), the Government organised a two-day national conference in Vijayawada, Andhra Pradesh. Representatives from 20 states participated in the Conference, along with visiting fair price shops and godowns to get an exposure to the devices and new technology being used and on-ground functioning of the system. The Home Minister has announced that the Government will establish a Border Protection Grid, in order to secure the Indian States bordering Bangladesh better. This is aimed at reducing the instances of illegal activities and creation of both physical, and non-physical barriers to entry.